The Jizera (German: Iser; Polish: Izera) is a river that begins on the border between Poland and the Czech Republic (in Silesia) and ends in Central Bohemia. Like some other names in Bohemia, the name Jizera is of Celtic origin, as the Celtic Boii (hence the Germanic word Bohemia, home of the Boii) lived in the area before the Roman times (see also the Isar in Germany and the Isère in France) before assimilation by the Marcomanni and later Germanic and West Slavic peoples. 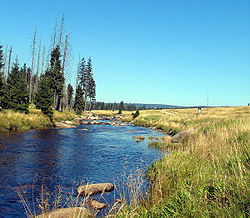 It is 167.0 km long, and its basin area is about 2,200 km2, of which 2,145 km2 in the Czech Republic. The river develops from the confluence of the Great Jizera (Velká Jizera) in the Jizera Mountains (Jizerské hory) and the Little Jizera (Malá Jizera) in the Giant Mountains (Krkonoše), and flows for 164 km into the Labe (Elbe) at the village of Káraný near Brandýs nad Labem-Stará Boleslav. On its way, it intersects the Ještěd-Kozákov Ridge. For the first 15 kilometers, the river constitute border between Poland and Czech Republic. 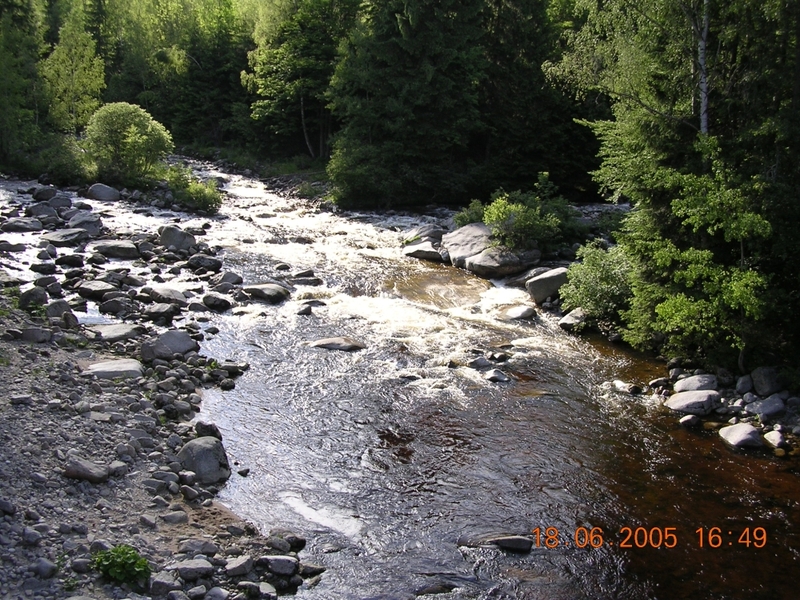 Jizera river is also one of two biggest resources of potable water for the city of Prague and other neighboring villages and towns (the second one is Želivka). 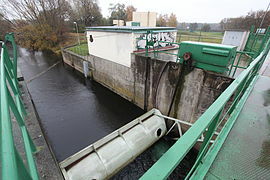 From Benátky nad Jizerou to its on-flow, it is surrounded by bank infiltration system, and in the district of Sojovice, the water is being pumped for artificial infiltration. Bank or natural infiltration in process of water purification in Sojovice district. Pumping water site for artificial infiltration in Sojovice district. ^ Zdeněk Váňa. Svět slovanských bohů a démonů. Praha: Panorama, 1990, p. 11. ISBN 80-7038-187-6. ^ "Charakteristiky toků a povodí ČR - Jizera" (in Czech). VÚV TGM. Retrieved 2018-05-07. ^ Křivánek, Oldřich a Kněžek, Miroslav (2001). Zdroje pitné vody v Káraném. Principy získávání vody v oblasti káranské vodárny. Pražské vodovody a kanalizace a.s.
Horáčková J., Ložek V. & Juřičková L. (2013). "Malakofauna v nivě Jizery (Severní Čechy). [The mollusc fauna of the Jizera floodplain (North Bohemia)]". Malacologica Bohemoslovaca 12: 48–59. PDF. This Mladá Boleslav District location article is a stub. You can help Wikipedia by expanding it. This page was last edited on 7 May 2018, at 16:09 (UTC).